Code faster and more accurately, achieve compliance and maximize reimbursement with SMFM's Coding Course. Designed especially for maternal-fetal medicine physicians, practice managers and MFM staff, the SMFM Coding Course is the most comprehensive and interactive course of its kind. Enjoy class discussions, live polling, and case studies with national experts in coding. View the complete agenda and speaker line-up here. Register. There are two ways: 1.) click on the aqua "register now" button below to begin online registration. This option is available to both SMFM members and non-members; or 2.) download the course brochure, which includes a registration form on the last page. Please note: advance registration will close on September 30 and re-open onsite in Philadelphia on October 18. Book a hotel room. The Coding Course will be held at the Hilton Philadelphia City Avenue. A block of rooms has been reserved for course attendees at a discounted, group rate of $152 per night. To enjoy this special rate, reserve your room on Hilton's website or call +1 (800) 445-8667. 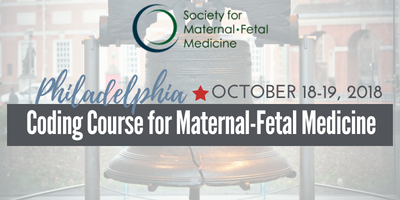 Please identify your affiliation with the Society for Maternal-Fetal Medicine Fall Coding Course when calling. The special room rate will be available until September 26th or until the group block is sold-out, whichever comes first. Exhibit and sponsorship opportunities are available. Click HERE to download the exhibit and sponsorship prospectus. Earn up to 11.5 credits of CME. Questions? Please contact Darryl Diamond at ddiamond@smfm.org. Registration fees include continental breakfasts on both meeting days, lunch on Thursday, coffee breaks, and access to course materials online. SMFM welcomes new members. Join now to save on this course, as well as all of our educational offerings. From MFMs and fellows to practice administrators, billing and coding experts, genetic counselors and nurses, there is a membership option available for all stages of your career.